Giraffes are the world’s tallest species but Greed has made their lives brutish and short. 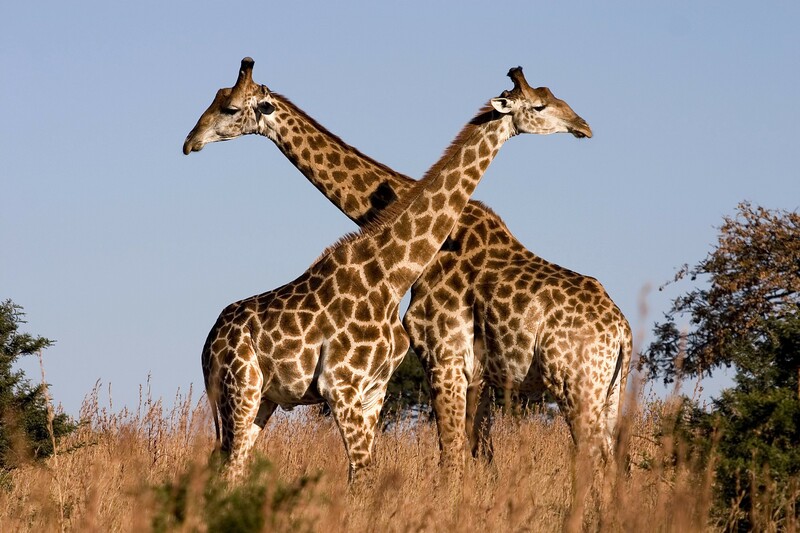 A pair of Kordofan (Congolese) giraffes (Giraffa camelopardalis antiquorum) in the Chad. Let’s stop the “Silent Extinction” of Africa’s fast disappearing “Sentinels of the Savannah” before they are all gone. By Allen R. Sandico KTJ MPA FRGS| Founder and Chief Elephant Officer™ (CEO) of Tusk Task Force. In today’s Extinction Economy, hundreds of the world’s biggest underdogs are killed for their parts by poachers whose profits fund terrorism every single day. We refer to these underdogs as the African Trifecta — elephants, giraffes, and rhinos — whose numbers are on the brink of extinction. Our only purpose is to stop this madness. While we were originally founded to protect the elephant, we realized that their preservation also depends on the survival of the other two iconic species that share their land — the giraffes and the rhinos. Hence, our vision of mitigating the threat of violence and terrorism on the iconic African Trifecta of the world’s wildlife is to save all three. Elephants are killed every 15 minutes for their ivory. Rhinos succumb to poaching every 2 hours for their horns. Indeed, our mission seems impossible but we must stop this travesty, now. The Extinction Economy has been going on for over a century but the last twenty years has been crucial in determining the survival of the last remaining numbers of the last remaining iconic species of the world. With elephants recently exiting zoos due to inadequate space and facilities, giraffes have taken over to become the resident “rockstars” of zoo keepers. Every zoo seems to have them and for good measure, they are much more timid and easier to take care of than their larger cousins. According to zoos, they do not need that much space. While we disagree, the reality is that giraffes have become larger than life with zoo visitors getting the impression that they are doing alright in the wild. But don’t let their peaceful scenery in zoos deceive you. Their lives are mired in extreme violence in the wild and their population margins are much smaller than the elephants and rhinos. In other words, they are going through a silent extinction because of the lack of attention to their plight, overshadowed by the big press given to their bullish and larger cousins. Giraffes’s population has plummeted by 80% since 1999, from 140,000 then to fewer than 80,000 now. Angolan/Namibian (N Namibia, SW Zambia, Botswana, and W Zimbabwe) are estimated at 20,000 in the wild. Kordofan (S Chad, CAR, N Cameroon, NE DRC) are fewer than 38 in the wild. Masai/Kilimanjaro (SE Kenya, Tanzania) are estimated to be under 40,000 in the wild. Nubian (E South Sudan, SW Ethiopia) are less than 250 in the wild and classified as vulnerable. Reticulated/Somali (NE Kenya, S Ethiopia, Somalia) are estimated to be less than 5,000 in the wild. Rothschild’s/Baringo/Ugandan (Kenya, S Sudan, Uganda) are less than 700 in the wild and are now endangered. South African (S Botswana, SW Mozambique, S South Africa, S Zimbabwe) are estimated at 12,000 or less in the wild. Due to the silent extinction that the species are enduring, we decided to be the only US-based NGO focusing on saving the giraffes (along with the elephant and the rhino) as part of its wildlife conservation mission. We do not take this role lightly for the seriousness of the giraffe’s demise cannot be overemphasized enough. They are valuable allies to the rest of the wild in Africa. In other words, giraffes save lives. Giraffes contribute to the survival of the other species that depend on alertness from other predators. These mighty long necks serve as “watchtowers” for the other “shorter” species when danger becomes known. Unfortunately, it is also their high (pun!) profile that gets these clumsy species in big trouble from poachers and hunters. They are easy targets, to those killers of fun and profit, in more ways than one. Pervasive poaching of giraffe has been reported in the Democratic Republic of Congo, Kenya, and Tanzania with their heads and bones believed to be sold for US $140 / UK £107 / EUR €119 each in the black market. Giraffe meat also provides a substantial source of income for impoverished rural communities in rural Africa along with their brains and bone marrow, sold as fake cure for HIV/AIDS and cancer in China and Vietnam by smugglers. Giraffes are one of the top targets of trophy hunters in South Africa, Namibia, and Zimbabwe, according to a recent study by the Humane Society International. Aside from poaching, poverty, and food insecurity, their silent extinction is exacerbated by habitat destruction due to deforestation, development, and farming. And our job is to make you listen too. We were not pulling any punches with the grim statistics above. We knew that they will hurt a bit. But, that is precisely the point. They must hurt, to compel you to act. So, let’s get to work, shall we? Along with the UK-based Giraffe Conservation Foundation and the Giraffe Conservation Alliance, we aim to improve the population outcome of giraffes that is free from harm, due to human conflict and human violence. Our vision and mission to save the species are three-fold, through advocacy, intelligence, and protection. Support global advocates on all levels, aligned with our mission, promoting giraffe conservation. Corroborate each source of intelligence we acquire using “triangulation” or “five points” methodology to make sure that the source is as accurate as possible. Collaborate with other NGOs, specializing in humanitarian aid and programs alleviating poverty, in our target areas so local communities choose alternative and sustainable economies (such as agriculture and alternative energy) over poaching or other violent commerce — towards a vibrant wildlife economy instead of a violent extinction economy. We regard it as a sacred mission to stop the evil commerce of wildlife trade for it continues to rob the world, especially Africa, of its treasures and people. To that end, we support all types of development programs that will enable sustainable communities out of poverty and insecurity so that local people would choose a vibrant wildlife economy over a violent extinction economy. So, the next time you see a giraffe in a zoo, look a little harder at what you see and know that their counterparts in the wild are not doing so well. The good part is that you can still do something about it and now is the time. If you hesitate, the only place you will see a giraffe is behind the fence in front of you and that’s not a good thing at all. Join us to #EndSilentExtinction now to save giraffes. Join our mission, share our passion, and help build our vision to abolish all exploitation, terrorism, and violence on wildlife at tusktaskforce.org. Follow us on Twitter and Facebook to find out more on how to #RaiseTheShieldForWildlife to #StopWildlifeTerrorism and #EndExtinctionEconomy #SoThatWildlifeMayLive. Together, we must be #UnitedForWildlife to #AbolishWildlifeTrafficking worldwide #ForWildlifeFreedom everywhere they roam.